Ranger arrived on our door step after spending his first 3 months living on the streets of Waskaganish on the eastern shore of James Bay. A lively husky-shepherd cross, there is an added dash of Corgie thrown in for good measure! 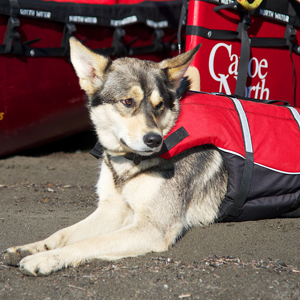 On Ranger’s first canoe-trip he quickly adapted to river-life, roaming the beaches, hunting for mice, fishing for trout and hanging around camp. And he learned ALL about porcupines!! His first whitewater encounter occurred when he got separated from his hiking group and promptly hurled himself into the frothy waters of the Ekwi River making a daring crossing amidst hollers of encouragement from the shocked hikers watching from the opposite bank.